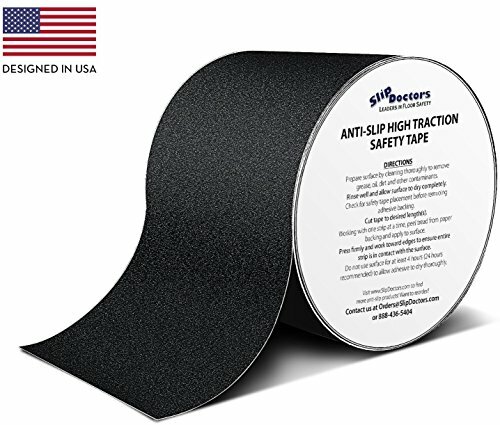 SlipDoctors Black Anti-Slip Safety Tape is the top-quality choice for general purpose applications. Have someone you love? Do something that matters, help them stay safe! SUPERIOR ANTI-SLIP TRACTION: Aluminum oxide compound embedded on a thick PVC base coat. Advanced acrylic adhesive provides an extra strong bond that stays put for durable, long-lasting coverage. NO MORE PEELING AFTER 2 DAYS: Designed in the USA to withstand environmental elements such as rain, snow and heat. MULTIPLE SURFACES: Use indoor and outdoor on steps, stairs, ramps, decks, metal, wood, laminate, tile, stone, concrete and other smooth surfaces. Perfect solution for tough non-slip protection for children, families, the elderly and pets. Also for tough environments to protect ramps, trailers, ladders and on machinery and safety equipment. EASY APPLICATION: SlipDoctors versatile tape can be cut to any length for maximum coverage. Apply to clean, dry surface. Just peel back adhesive and apply. 10-YEARS: Included with your purchase, always.